There is life everywhere throughout the Milky Way Galaxy. It takes forms that will astonish and frighten, that will challenge and terrify as they exist within the greater fight of existence: Eat or be eaten. But to the crew of the frigate Basalt, those alien life forms that exist in the near vacuum of interplanetary space only serve to be of fascination in the crew's quest for knowledge. However, there is a vicious conflict brewing as the octopoids test the occupants of an outer planet of humanity, in all its varied forms, probing and looking for the weaknesses of the marshalled forces. But who is the enemy really? The crew of the Basalt are celebrities throughout the Human Sphere of Existence, made famous by their adventures over the years and glamourised by the Games Board, who broadcast to the masses. As the Basalt‘s crew continue their investigations into the Urchin creatures, a Games Board sanctioned conflict between two corporations over control over resources near the planet of Storfisk begins. But the Artificially Created Entities (ACEs) living on the planet have noticed a strange alien life form feeding on the local animals. Something more sinister is going on on Storfisk. I’ve enjoyed reading each book in this series, but I have to admit to liking this one the best so far. 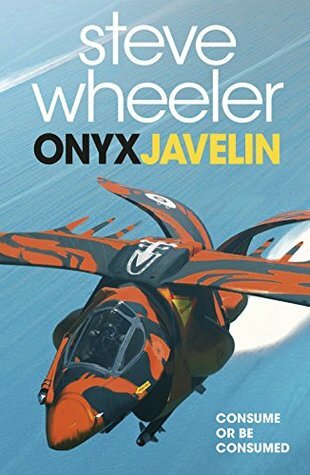 While the previous books were more of a collection of shorter adventures of the Basalt and her crew, Onyx Javelin widens the focus to several points of view, showing parallel stories that converge on the planet. Not only that, but this book ends on a cliffhanger, leaving plenty of room for more of the story! I like this format a lot more as it allows for the slow build of tension through the whole book. The characters still tend to be slightly wooden at times, but I was much too busy enjoying the amazing worlds that Steve Wheeler creates for his characters to play in and admiring their no-holds-barred technology. The concepts explored in this series are really interesting – nearly everything in the Human Sphere is controlled by the Games Board and their need to stream AV to the population of the inhabited worlds. No-one is in permanently killed in their sanctioned conflicts because they’re fitted with Soul Savers that allow their consciousness to be inserted into a new body, even if it takes a while to regrow and many people are augmented with implanted technology or prosthetics of some sort. Then there are the creatures. There are a host of weird aliens in this universe but my favourites are definitely the human-created ACEs. They’re basically highly intelligent children in robotic animal bodies – I want one! Occasionally the flow of the story gets bogged down in technical details – describing every moment of a complex maneuver or procedure for example, but the action sections are very exciting. I’ll look forward to seeing what adventures lie in store next! – A richly imaginative high-tech space opera.